How did the world’s most vital resource become imperiled? And what must we do to pull back from the brink? In “stark and nearly devastating prose” (Booklist), world–renowned activist and bestselling author Maude Barlow—who is featured in the acclaimed documentary Flow—discusses the state of the world’s water. Barlow examines how water companies are reaping vast profits from declining supplies, and how ordinary people from around the world have banded together to reclaim the public’s right to clean water, creating a grassroots global water justice movement. While tracing the history of international battles for the right to water, she documents the life-and-death stakes involved in the fight and lays out the actions that we as global citizens must take to secure a water-just world for all. 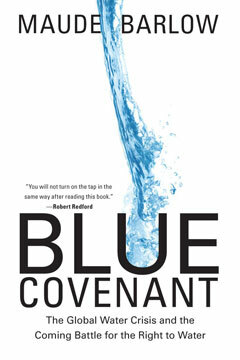 As people around the world turn their attention to the effects of climate change, Blue Covenant is a timely and important reminder for us to take heed of the global water crisis’s impact on humans and the natural world.